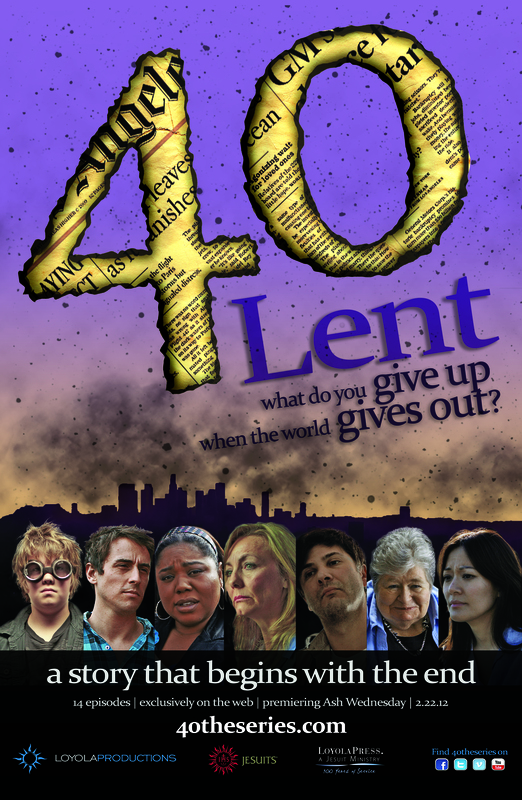 Los Angeles — Loyola Productions’ new post-apocalyptic drama 40 — produced in association with the Midwest Jesuits and Loyola Press — offers viewers a unique Lenten experience delivered exclusively through the Internet and social media. This innovative program appeals to believers and seekers alike, and is ideal for individuals and groups. 40 premieres Ash Wednesday, February 22, 2012, and shepherds viewers right up to Easter Triduum. Each week during Lent, two new episodes will air on the series’ original website — 40theseries.com — as well as on YouTube, Vimeo and Facebook, with updates available through Twitter. Each of the 14 (4–7 minute) episodes acts as a Lenten allegory and is accompanied by meditative reflections centered on the scriptural references. 40 begins with seven strangers who appear to be the only survivors of a mysterious, calamitous event: Los Angeles is empty, devoid of people. No sign remains of family, neighbors or co-workers. No space ship hovers over the city, there are no zombies or flesh-eating viruses. There are just seven strangers, who share the same iridescent blue mark on the shoulder, a tiny, precise square of color that wasn’t there yesterday. Were they chosen? Or have they been culled? By whom? For what purpose? 40 stars George Gallagher, Ethan Flower, Cherinda Kincherlow, Peggy Miley, Jan Broberg, Caroline Pho, Jack Little and Damon Murphy. Episodes will air on Mondays and Wednesdays during Lent. For more information and to view the full schedule of airdates please visit http://40theseries.com or search for “40theseries” on Youtube, Facebook, Vimeo and Twitter. Los Angeles — A growing number of Catholics are finding inspiration and reflection this Lenten season through an unlikely source: the Internet and social media. The producers of “40,” a post-apocalyptic Web-based drama that debuted on Ash Wednesday, report they have seen a steady growth in viewers across its Web, YouTube, Vimeo and Facebook platforms. “40” offers viewers a unique Lenten experience through weekly episodes aired on 40theseries.com, YouTube, Vimeo, and Facebook. Each of the 14 episodes acts as a Lenten allegory, accompanied by meditative reflections centered on the scriptural references. Updates are communicated through Facebook and Twitter. Religious education programs across the country have adopted “40” as part of the their Lenten curriculum. St. Cornelius Catholic School in Chicago has integrated “40” into its 7th grade confirmation curriculum. Students watch “40” in class and then discuss each program’s message and reflection. Barth noted most students use technology at home and in school. Using Web and social media based religious education programs like “40” helps to show students how to integrate what they learn in Confirmation class into every day life. High school juniors taking Victor Cancino, S.J.’s inter-religious dialogue class at Verbum Dei High School in south central Los Angeles are using “40” to learn more about Catholicism’s rituals. Cancino said after watching “40” each week, students write about the week’s episode in their journals as a way to deepen their faith, understand their lives and learn more about the Catholic Church.